I recently attended and thoroughly enjoyed the Talent42 conference in Seattle – John Vlastelica and Carmen Hudson have done a fantastic job, and I was also honored to be asked to present the closing keynote on the current and future state of sourcing. Aside from the stacked speaker lineup, valuable content, sourcing roundtables led by a good portion of who’s who in the sourcing community, and power + wireless for all (other conference organizers please take note! 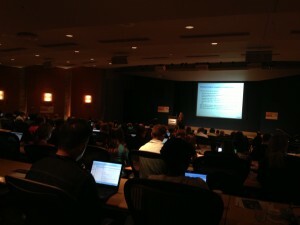 ), what I especially enjoyed about Talent42 is the fact that it is the only technical recruiting-only conference. My entire career has been focused primarily on the technical recruiting, so it was nice to spend a couple of days in the company of people who share a similar recruiting background and appreciate the unique challenges associated with sourcing and recruiting IT professionals. As my keynote presentation had a lot of animations, off-slide commentary and embedded videos, I took the time to modify the slide deck so that it could be largely understood that without the benefit of hearing me speak to the content (I wish more presenters would do the same!!! ), and I have uploaded it to Slideshare, complete with informative, funny, and controversial YouTube videos. In this presentation I address what I feel is the current state of talent sourcing as well as what I believe the future of talent sourcing will be, sooner than later. Additionally, I demonstrate Facebook’s Graph Search and offer insight into functionality from several “Big Data” talent sourcing tools, including Dice Open Web, TalentBin, Entelo, and Gild.